Photomontage/Massing Study for proposed residential development, Romsey, Hampshire for the Terra Firma Consultancy. Photomontage/Massing Study for proposed residential development, Petersfield, Hampshire for the Terra Firma Consultancy. ZTV and Photomontage/Massing Study for proposed residential development, Petersfield, Hampshire for fabrik. ZTV for proposed residential development, Alton, Hampshire for Neil Tully Associates. ZTV and Photomontages for Durand Academy proposal, Midhurst, West Sussex for fabrik. Visual sensitivity mapping for proposed new settlement, Monard, Ireland for Nicholas de Jong Associates. ZTV for proposed wind turbine at Mulloch Park, Dumfries and Galloway for fabrik. Photomontages, East Cowes Marina, Isle of Wight for Capita Lovejoy. Photomontages, former aerodrome site, north M25 distribution centre for Capita Lovejoy. ZTV studies, Allerton Energy from Waste power station, North Yorkshire for Martin Woolley Associates. ZTV study, Corringham residential development, Essex for Neil Tully Associates. ZTV study, Martlesham Heath hotel development, Suffolk for Neil Tully Associates. Photomontages, ProLogis Hartland Park, Hampshire for Capita Lovejoy. Photomontages, ProLogis Newbury Park, Berkshire for Capita Lovejoy. ZTV study, Manchester Business Park. Photographic Study for Stockley Park Phase III for Catherine Bickmore Associates. Photomontage massing study of Canada Water, London in respect of Strategic Views of St. Paul’s Cathedral for Bell Fischer Landscape Architects. ZTV and Photomontages, Queenborough, Isle of Sheppey mixed development for Catherine Bickmore Associates. Photomontages, former aerodrome site, north M25 distribution centre for Lovejoys London. Photomontages, Luton town centre, retail redevelopment for Lovejoys London. ZTV study, Woking Waste and Composting Plant proposal for fabrik. Photomontage massing study, new leisure development, Guildford city centre for gld. 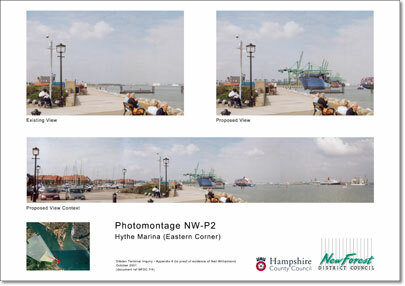 Photomontages, Dibden Bay Terminal development, Southampton Water for New Forest District Council. ZTV study, Katrine Reservoir, north of Glasgow for ERM. Photomontages, Saltend Chemical Works for ERM. Photomontages and ZTV Study, waste from energy plant, Guildford for gld. ZTV study, two wind farms at Holderness, East Riding of Yorkshire for Gillespies, Manchester. ZTV study, quarry extension, Buxton, Derbyshire for Gillespies, Manchester. Photomontages, quarry extension and associated buildings near Holborough, Kent for Chris Blandford Associates. Photomontages, Warner Brothers "Movie World" proposal, Hillingdon, West London, for Gillespies, Oxford. 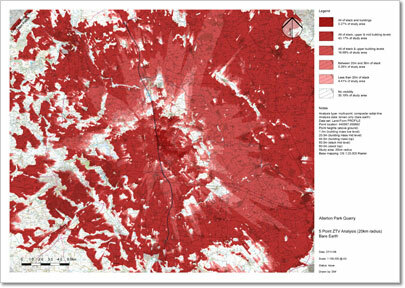 Lecturer in landscape architecture and digital design, including visual impact assessment techniques taught at post-graduate level. ZTV mapping and landscape study for temporary drilling rigs near Sellafield, Cumbria. Photomontages and landscape study, Otterburn Training Area (MOD), Northumberland. Visualisation, waste incinerator, Belvedere, Greater London. Visualisation, Landfill site at Mucking, Essex. Visualisation, windfarm near Oban, Scotland. Visualisation of pedestrianisation proposals at Peascod Street, Windsor. Co-development of in-house software for visual impact assessment (ZTV). ZTV and photomontage, Trawsfynydd power station, North Wales. ZTV and photomontage, Wylfa power station, Anglesey. ZTV, PFA mounds Kingsnorth power station, Kent. ZTV study, testing visual relationship between Salisbury Cathedral and proposed housing development, Salisbury, Wiltshire.